Bailey’s owners had been up all night. Their 8-year-old Maltipoo had been hacking, wheezing and coughing incessantly, and the couple’s bleary eyes and ashen faces told me they were spent. As I examined their croupy canine, they recalled how a soft gurgle in Bailey’s throat had turned into a gusher of gasping over the past couple of weeks. They’d tried everything: raw garlic and honey, coconut oil and a humidifier. The cough seemed to lessen at first but worsened dramatically over the past three or four days. They were worried sick and desperate for answers about dog coughing. 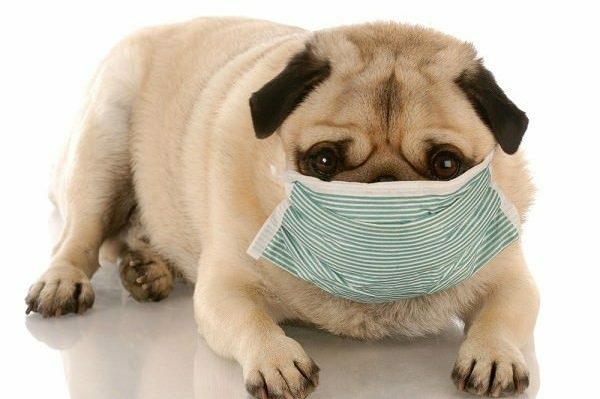 A sick pug with a mask on. Photography by Shutterstock. There are many potential causes for dog coughing. Allergies and respiratory tract infections caused by “kennel cough” and canine influenza top the list followed by anatomical problems including collapsing trachea and COPD (chronic obstructive pulmonary disease), heart disease caused by heartworms or failing valves, lung diseases such as bronchitis and sometimes a combination of these. Cancer is also a consideration, especially in older dogs or in high-risk breeds like Dobermans, Irish Setters and Boxers. We reviewed Bailey’s immunizations (current); medical history (a brief bout of diarrhea 10 months earlier); recent travel history (none); visits to a groomer, kennel or dog park within the past two months (nope); and any other clinical signs that might give us a clue (nothing). Bailey’s owners couldn’t recall anything unusual. But I had discovered something during my exam. Within an hour, we had our initial results: congestive heart failure. Bailey’s mitral valve was leaking, causing fluid to accumulate in her lungs, triggering a desperate reflex to cough the fluid out. I compared Bailey’s condition to inhaling water and the stress and anxiety “dry drowning” creates. Our treatment would be aimed at removing fluid from the lungs and helping the heart pump more efficiently by dilating blood vessels and increasing the heart muscle’s contraction. I prescribed a diuretic (furosemide) and pimobendan, a drug shown in clinical studies to extend life expectancy in dogs with mitral valve disease. Bailey would need to have regular checkups to assess her heart disease and allow us to intervene early should changes develop. Bailey slept like a baby that night. At our 48-hour checkup, Bailey’s owners appeared well-rested and grateful. Within two weeks, Bailey was strong enough to visit her groomer for a quick trim (her full grooming would have to wait a little longer). One month later, her chest X-rays and cardiac ultrasound demonstrated significant improvement, and Bailey got the green light for a trip to the lake. At our last appointment, Bailey’s owners expressed regret for waiting so long to seek help. I assured them they had done their best, and it was ultimately their love and concern that helped save Bailey’s life. Coughing can be a challenging diagnosis for dog parents. Many believe dog coughing is caused by allergies or minor infections, and many times they’re right. It’s when pet parents are wrong about coughing in dogs that the most severe consequences occur. If Bailey’s owners had delayed another day or two, I’m not sure she’d be alive today. If your dog’s cough persists more than a couple of days, have it checked by your veterinarian. No matter how subtle or soft, loud or quiet, dog coughing is a serious symptom requiring attention. Dr. Ernie Ward is an internationally recognized veterinarian known for his innovations in general small animal practice, long-term medication monitoring, special needs of senior dogs and cats and pet obesity. He has authored three books and has been a frequent guest on numerous TV programs. The post Is Your Dog Coughing A Lot? What to Do Next appeared first on Dogster.